Posted February 20, 2017 by Rob Smedley & filed under Episodes. Hahahahahahaha. What. Is. Going. On?!? No, seriously (that laughter was just desperation), what’s going on? It’s the penultimate episode and I’ve still no idea where Taboo is heading, or why. In fact I’m at a strange nexus where I’ve no idea what will happen next but can barely remember what’s happened before. That’s not because I’ve got a bad memory – I still remember reviewing all of ITV2’s Switch, albeit mostly in PTSD style flashbacks – it’s just that the past six episodes have all been so similar that they’ve blended into grunting and darkness and blood. 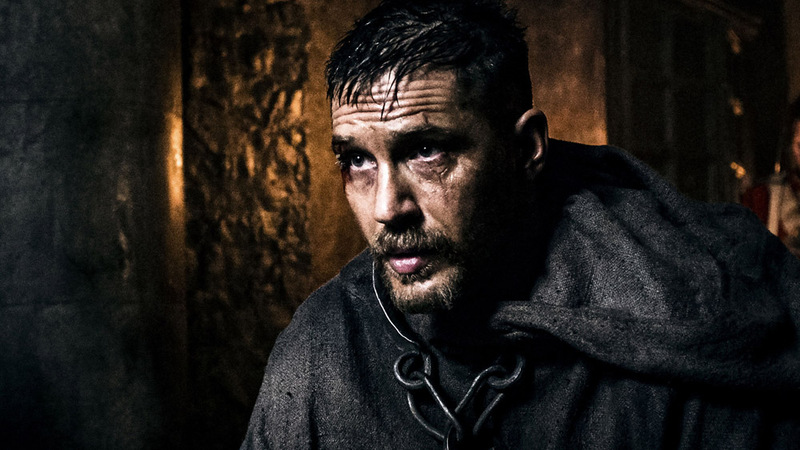 Taboo is now the TV equivalent of the manufacture of black pudding. And like black pudding, even when you know it’s doing you no good you can’t help having a slice. Apologies, vegetarians, I missed breakfast today. …On to a different murder. After being found dead last week, Winter is buried at sea. As her body is plonked in the river to be washed away there’s a little boy deliriously spinning round on the muddy shores of the Thames before collapsing in the muck, thus providing us with a perfect visual metaphor of the viewer’s experience when watching Taboo. Arch-prostitute Helga blames Delaney for Winter’s death, and angrily shoots his hat off in a moment more suited to a comedy Western. Well, I laughed, then mourned the murder of a piece of perfectly good millinery. Later in the episode Delaney is seen wearing the same hat and it doesn’t seem to have a bullet hole in it, though it was hard to tell on the preview copy. Or maybe his hat now whistles when the wind’s blowing in the right direction. Helga is wrong of course. It wasn’t James who murdered Winter, it was the East India Company. That’s right, they specialise in child murder now. It’s a diverse business portfolio. But that doesn’t stop her marching into their offices and telling sweary Sir Stuart Strange all about Delaney’s gunpowder activities. Delaney is arrested by the Crown and tortured in England’s premier thumbscrews location, the Tower of London (currently only 162 ‘Terrible’ ratings on TripAdvisor, although that number was much higher back then). For the duration of it he has a sack over his head which, along with his gruff voice, makes it seem like Bane from the opening scene of The Dark Knight Rises is taking a cheese grater to the thigh. Tortured with said cheese grater, then waterboarded, then drugged and torture-snorkelled for names of co-conspirators (if you’re thinking of starting a death metal band, Torture Snorkel is up for grabs), Delaney refuses to give up the names of his gunpowder-making co-conspirators. He demands to see Sir Stuart Strange again and again until eventually, after sampling every part of the Tower apart from its gift shop, Delaney gets his wish. Stuart Strange is summoned only for Delaney to tell him the last thing you’d expect to hear: he ‘has use for him’. What use? Who knows. There’s only one episode left for Taboo to make sense of itself, but with all this talk of the writers and producers planning for a second and even third season, I’m slightly terrified that Taboo will have the outrageous – and unearned – balls to end on a cliffhanger. It’s been a bold, intriguing, even delirious piece of television, but how it will be judged as a story in the future will depend entirely on how it sticks the landing in its finale. And that’s a lot of pressure to put on an hour of TV. I’m keeping my fingers crossed that that last slice of black pudding is a good one. Aired at 9.15pm on Saturday 18 February 2017 on BBC One.